I've been using the SparkFun one for a while, but it's not absolute nirvana. 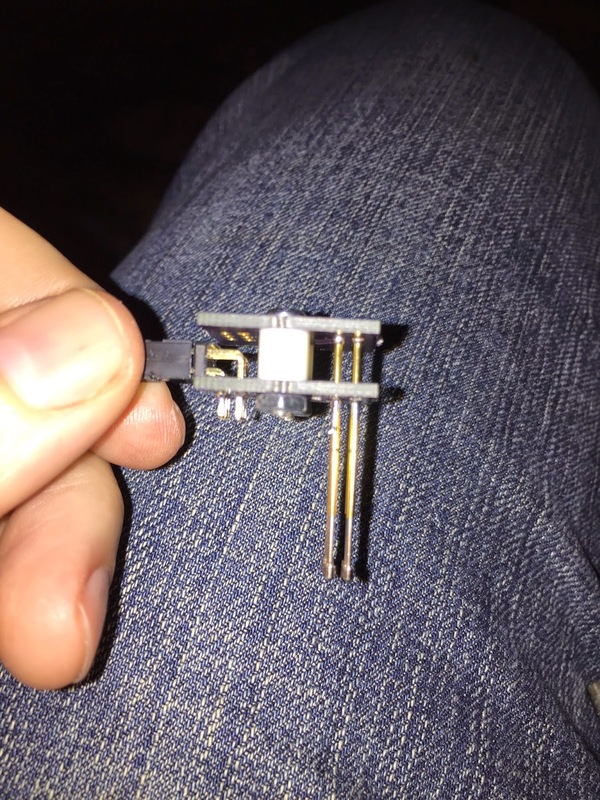 In particular, I don't have any use for the molex connection or the JST power jack, and having the host jack be on the top makes it somewhat more awkward to hold. So I came up with what I think is a better design. You start with a very simple board with two 6 pin AVR ISP footprints. Be sure that the holes are 46 mils. Connect each pin on one to the matching pin on the other. Put two #4 holes on either side, insuring that you've got enough space so that the screw head won't abrade any of the traces. Here's the OSH Park shared project for my design. 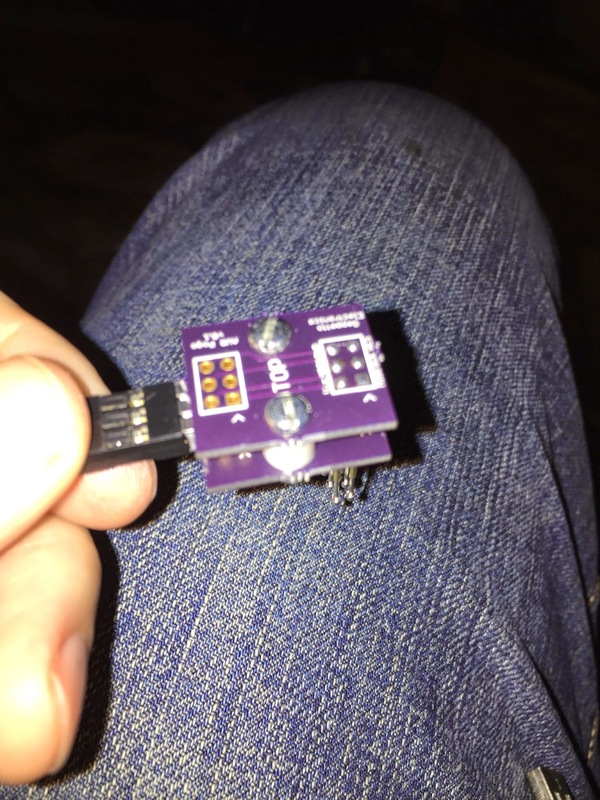 To make one adapter, you need two of these boards. You also need two 1/2" #4 bolts, two #4 nuts and two #4 1/4" standoffs. You'll also need 6 pogo pins and a 2x3 .1" right angle header. Start by picking one of the boards to be the bottom board. Solder the right angle header into the ISP footprints that is not the one next to the writing that says "Pogo pin side." This is the side with the pins named. Next, use 2 1/2" #4 bolts and nuts and a 1/4" #4 standoff to attach the two boards together, placing the one with the right-angle header on the bottom. It is critical to insure that the two boards are oriented the same way - both TOP sides up, and both facing the same direction. If you get this wrong, the adapter will be miswired. Place some scotch tape on the top of the top board, covering all of the holes in the ISP footprint that is marked "Pogo pin side." Flip the boards over and carefully insert the pogo pins into the holes, with the silverish, pointy ends up. Be very careful with this, as the pins are easy to bend (which will ruin them), and are a very, very snug fit (they're 40 mils wide, and the holes are ostensibly 46 mils wide). Make sure the ends of the pins come through the holes in the top board and rest against the tape. When all the pins are in place, the tops of the pins must be level. Take a moment to check that the pins are square, straight and the tops are level. If the pins are racked at all, twist the boards relative to each other, loosening the hardware slightly if necessary. When the pins are placed properly, solder them to the bottom board. Once that's done, remove the scotch tape from the top board and solder the tops of the pins to the top board. Attach your programmer to the header, being sure to put pin 1 on the pin 1 end (you can look at the markings on the top board to figure that out). Orient the pogo pins so that the pin 1 marking on the board match the target. Press down slightly so that the springs put a little tension on the target, but not so much that the springs bottom out. Hold it there and do whatever needs doing.